At Wood Pipe Organ Builders, we build, repair, restore and tune pipe organs to the highest standards. Creativity and craftsmanship are at the heart of our work. Based in the north of England, we care for some of the largest instruments in the UK – and some of the smallest. Whatever the size, our dedication to quality remains constant. From voicing pipes to restoring historic instruments, from refurbishing organs to relocating them, our family firm offers the full range of services and we take pride in working with organists to find a musical solution. We blend traditional techniques with sophisticated technology to give players and listeners a rewarding experience. 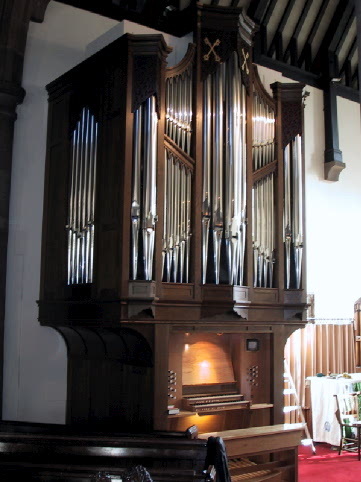 ​Our experienced, Yorkshire-based team has expertise in repairing and tuning pipe organs of all ages and types and would be delighted to offer you a quotation. The mechanical action organ by Wood Pipe Organ Builders in St Peter's, Chorley.